This extension is available in the Shop. Hi, I am thinking about buying this. But is it possible to schedule imports with cronjobs? The solution was related to exporting, so unfortunately not useful for what you want to achieve. How would you want to go about importing with a cron job, from a specific URL? Hi, yes excactly. Would make the import from a external URL. Thanks Martin, I’ll take it into account as a suggestion for a possible future enhancement. At the current version I don’t see an easy way to accomplish this unfortunately. I’m considering purchasing the Groups Import & Export plugin, however, I need to know if it will handle my needs. In this example, it would need to create up to 3 users (the user might already exist), and then create & assign up to groups (again, might already exist). You can do it, please have a look at the ‘update ecxisting users’ option, in the documentation page. You can use the ‘test’ option before, also we recommend make a full backup before. On the Groups page, use the import and export functions to add new users and groups. However, you can’t remove users or groups. Also, you can’t add new users to your course during these processes. You can use the bulk action available above the users table (Users->All Users) for remove users from groups. Remember that you have available a ‘test’ option in Groups->Import Users if you need to test the function. Hi there plugin seems good but is there a way that instead of already generating a password on the email the user can just click the link to create a password? similar to the wordpress users when you create a new one. i.e click here to change password? Also i read alot if i update the users there password changes? does this still happen? the plugin uses the wordpress welcome email system. If you find a plugin to send the reset password on the welcome email, this should work. Sorry, I don’t know any plugin. Is there any reason why the export does not include the user ID? I need the user ID to tie users with data from other files based on other user meta. Any workarounds for getting the user ID in the export file? really the user’s id is not exported because if you import this file, you could have these ids already stored. You could customize the plugin to add the user’s id in the groups-import-export/lib/core/class-groups-user-export.php around line 134. But remember that if you change this file, when you update the plugin, the changes will be lost. If a plugin is purchased, are upgraded included for free, or will I have to pay again for new versions? You will have available a year of upgrades, please have a look at the Terms and Conditions page. I’m trying to determine the correct licensing level for our usage. We have one site, but it will live on 3 servers. Development, UAT, and Production. Do we need to purchase a single license or multi-install license? We ill be purchasing both the import export and the restrict categories extensions. please have a look at the license page. I’m having a bit of difficulty with the import function. I tried to import a list of 407 people in a txt. file. Whenever I would try to import, even though I would edit import limit to accommodate the number of users I wanted to import, it would only import 75-100 users per attempt. I basically had create several txt. files and do multiple imports for something that should have been quick and pain free. Does anyone have insight on a fix for this since I plan on using the import function a lot in the the coming months. You can use the same file to import them in several rounds as the existing ones will be skipped. This is due to PHP memory and execution time constraints. Simply use the same file and it will create the ones that haven’t been added before. That is exactly the format I am using that doesn’t work. It still changes the password every time. If you need me to open a full support therad, I’ll do that, because I am doing everything per the instructions on the page and per your instructions here and it updates the password every single time. OK that shouldn’t happen, I’ll check and let you know. You don’t need to open a support topic for that right now, I’ll follow up here. There was a bug that was causing this which has been fixed in the version just released. Please update the plugin to this latest version. Many thanks for pointing out the issue! Just to say thanks John. This is exactly what I was struggling with! I’m having a big issue with this plugin. Every time we try to upload and update users into a group, it generates a “Your Password Has Been Changed” notification and changes the user’s password. We’ve been importing with just an @user_email field and we only want to bulk add users to groups based on a list of emails we’ve got. How can we get the program to not update the user password, and if that is not possible, how do I get a refund as this plugin no longer supports the functionality we purchased it for. This sounds very similar to a question I have already responded to two days ago. See this reply. Also note that we have a premium support forum for this plugin which is here and where those questions should be posted. If you continue to have difficulties trying to import, please open a support topic there and we will help you further. In that case, please make sure to provide enough detail about the data you are trying to import and we might also ask you to provide admin access and an excerpt of the data file you need to import so we can run tests on it ourself and help you to successfully import it. BTW if you import users and have the option to update existing ones enabled but have not indicated a password, then a new password *will* be generated. To avoid that, you can indicate the column order and omit the password field, expand the help tab on the Import Users screen, also refer to the File Format section in the documentation. … and the Column Order section. The link to that comment does not load anything. I searched the comment ids and could not find that comment number either. Thanks John, the link works for me, anyhow, if you have a look at my replies from just a moment ago I think you should be able to complete the import successfully. We tried that option. So I should be able to set the column @user_email and add to group using just the user email without updating the password? Because that is how we tried it and that is what updated everyone’s password. It will simply add the users to the corresponding groups. 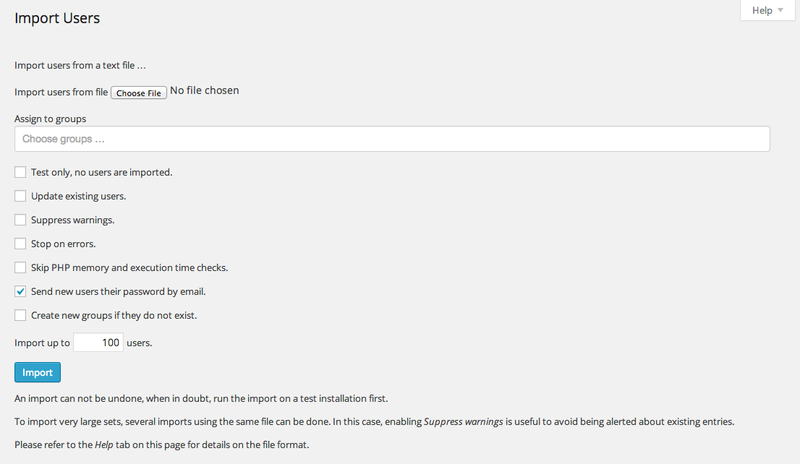 You’ll need to check the appropriate import options when importing the file (update users, create groups, …). PS : Note that there should be a tab between the email and group. I noticed there is no field (or discussion of) a Company field. All affiliates are companies, not individuals. I need to reflect a Company name on the landing page. I previously asked this question and it was answered, but with a user login. I need to import 6 fields: FName, LName, Company, Email, Website URL, and Telephone. This is the most basic info necessary to manage any program. 1. Can I import these 6 fields and display them if I create these (custom) fields in the software to receive this data? 2. Why does the software not mention landing pages .. it just assumes a home page landing .. and then gives that URL ID for affiliate. I have a custom landing page just for affiliates. What is the URL extension for an affiliate landing page called “www.domain.com/Apply”? You can use the column order declaration and indicate meta fields – see this section in the documentation. Please use this premium support area for further help on this plugin. There’s also a space for the Affiliates Pro and Enterprise plugins. And for your question, you can use any of the shortcodes that produce an affiliate URL, see the related plugin’s section on the Documentation site please, for example affiliates_url. Hi! I’m having trouble with the import. First, it seems like files saved by Microsoft Excel (on Mac) won’t get accepted, for some reason. I haven’t been able to figure out why. Also, there might be a problem with special (norwegian) characters (æ,ø,å). Do you have any recommendation for this? The email, first and last name are saved, but none of the meta fields. The meta names (e.g. “user_adresse”) corresponds to meta fields already created (and working fine in other parts of the system). Do you have any input on what might be wrong? The file format used must be a text file with values separated by tabs (the Excel file format differs but you can save your Excel files in that format). Please give that a try and also make sure that the encoding used is correct (UTF-8). See also http://docs.itthinx.com/document/groups-import-export/import-users/ on the import and http://docs.itthinx.com/document/groups-import-export/file-format-column-order/ for details on the file format. I’ve got a tens of thousands of subscribers and have them segmented in an external database (as I implemented groups only during the past year). How can I bulk assign users to specific groups so I can synchronize everything back? I want to do more group-specific messaging etc. I was thinking about doing the following: export my user list, vlookup against the Excel file I have, then (somehow?) import back again. Can this import/export do that? Do you have any suggestions? Much appreciated! Yes you can do that with this extension. If you’d like to have a look at the documentation page where you will find details on the process. PS By “that” I mean export and import again, I can’t say if there are any particular requirements that aren’t covered, but basically if you can map them to groups outside and then re-import, that should be an option. Feel free to ask if you have any questions related to what you see in the documenation. So, after weeks of testing the import/export plugin, I cannot get around one show-stopper issue: how to STOP the plugin from updating the users’ passwords… I disabled the send password via email option but the password still got changed? I basically want to add users to a new group via the import, that’s all. How can I disable the password reset functionality completely? I want to quietly update a user and give them access to new groups but not touch their password. I tested this on a staging environment with only Woocommerce, Woocommerce Groups, Groups and the Import/Export plugin active. Everything else was switched off. Please let me know because without disabling the password change functionality I cannot use it in my live environment. Thanks! If you want to add new users you need to indicate the password and it would be recommended to send them the email notification. For users whom you only want to update, you should omit the password field. You can simply do this with two different imports, one file you use for new users and another one for those you want to update. Please let me know if that helps or you need further help. So I’ll go and test the new version again now. Really concerning though that this bug has had such a business-destroying impact. I’m so grateful (to myself) for testing this out in a UAT environment and more importantly not with real users. Otherwise, it would have been a complete drama. Thanks. I’ll report back if it still doesn’t work. I’ve just noticed we can ask questions here instead of the main page of Groups, so sorry if my question appears twice. So, I’m interested in purchasing Groups Import Export, but first I need some information. If I add multiple contacts in a group, does the plugin can automatically generate their logins and passwords ? It’s important for me to know, since I have about a thousand people in my database and doing it by hand would be really time consuming… Or maybe you have another solution to suggest me ? you can select to send the passwords to the user’s email (passwords will be generated by wordpress). Please have a look to the documentation page to view the import file format. Groups Import uses the wordpress email registration. Maybe you can find a plugin to customize the welcome email. I was able to successfully import users from a tab-separated CSV file I uploaded. However, I noticed that the import did not honor the roles listed in the CSV file? It set all of the imported users to ‘Subscriber’. Any ideas on why it would do that? 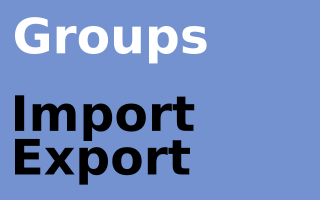 In Groups->Import users you must select the groups. Remember that the import function add the users to groups, not roles (‘Subscriber’ is a role). We’ll have a Group of around 100 members, which we’d like to export to a simple list, print, and bring to a music festival and be able to cross out people names as they turn up. However, I can’t seem to limit the plugin to only export first_name and last_name, that’s all we need. As it is now, all the information that gets exported makes it really hard for me to use. – Is it possible to only get a persons first and last name when exporting? This is a solution: go to Groups > Export Users, choose the desired Group and under Profile check the options Include extended user profile data and Include a column header, click in the field where the profile data fields are shown and press Cmd + A / Ctrl + A to select all and press Delete to remove all. The exported file will contain the data which you can easily edit as a spreadsheet to leave only the first and last name columns. Hello. I’ve left several comments since early yesterday about a serious problem with the Group Import Export extension and every time I come back to check on the status it just says that my comments are ‘awaiting moderation’. Could somebody please look at the comments from ‘EGFStech’, release them from moderation, and respond? My project is on hold while I wait to get this issue resolved. What is going on? I have been leaving several comments but they all say ‘awaiting moderation’ and do not change. This is my only avenue to get my issue resolved. Someone please respond. Hi, please have a look to support conditions. I have. I’ve been living on that page, scouring it, trying to find any way to be able to contact someone about my comments in moderation. It talks about ‘preferential treatment’ in the forums, but there are NO forums for Groups or related extensions. It also mentions that emailing support will not be tolerated. Then it seems the ONLY method of contact is the plugin comments. I even posted on the ITthinkx Facebook page in the hopes of getting someone’s attention. As I mentioned in another comment, I don’t remember having my comments in moderation before, maybe I didn’t notice it. But when you see, “awaiting moderation” it’s like getting a busy signal on a phone call as opposed to leaving a voice mail. With a voice mail you have a reasonable expectation that your message will eventually be heard. If you only get a busy signal then you have no expectation of response because your message hasn’t even been delivered. We will consider to improve suporte. I had posted this in the ‘Groups’ comments and just noticed that it probably should have been posted here instead. Sorry for the multiple posts. Error on line 1, ﻿ajd@egbubs.net is not a valid email address. 1 entry has been skipped. How is that not a valid email address? I’ve been using it for literally 7 years?! What’s going on here? Any help would be appreciated. Thanks. I just tried again with a different user that had seven characters before the ‘@’ symbol, just in case there was a problem with only three characters before the ‘@’ (though I don’t know why that should be a problem?). It still did not work. What is going on here? What is the criteria it is using to check for a valid email address? How do I override it? This add-on is useless if it will not let me import users with email addresses. Please help. I am now sitting idle trying to get this to work. I honestly see no problem with that email, if you want you can send us the txt file to support at itthinx dot com and we’ll test the file. Thank you. Thank you. Thank you Antonio for responding. My comments seemed like they were stuck in moderation permanently. Thank you for responding. I would be happy to send you the TXT file right away. BTW. Before yesterday I don’t remember ever having my comments ‘awaiting moderation’, is that something new or did I just not notice it before? It’s a LOT harder waiting when you don’t think anyone is even hearing you. Thanks for the clue Antonio. I discovered that the hidden character(s) is/are: Ôªø. I’m not sure what it is but I have an idea of how it came to be included. It is time-consuming to edit a tab-separated TXT file for hundreds of user accounts. So I create an ODS (OpenOffice spreadsheet) file to import/modify the user accounts. I save the file as a tab-separated CSV file and then change the extension to TXT. Somewhere in this process the ‘Ôªø’ character(s) get added. After doing some more research, it appears that the characters are a very hard to detect ‘UTF-8 byte order mark’, which appears to be an encoding error. These characters seem to be added by MacOS when I change the file extension from CSV (the format saved from OpenOffice) to TXT, the ‘Groups Import Export’ requirement. I’m working on a workaround solution now. First thing to try is to see if the Groups Bulk Import tool will allow a tab-separated CSV file. That would solve the problem right away. I found the solution and it turned out to be pretty simple. The tab-separated file does NOT need to be TXT, it can be a CSV file. This means that I can create/modify the user accounts in the OpenOffice spreadsheet and save it as a tab-separated CSV file and upload without issue. It seems that any open/save operation after the initial save of the CSV causes the file to be ‘spoiled’ and fail on upload. Issue solved. Thanks for your help. Please review my comments and provide some assistance regarding this problem. Much of my project is on hold waiting for this to be resolved. I have a large number of users to setup and migrate. I have already imported about 2000 users via another method/plugin. Now, I just need a quick way to assign various users to their respective groups. What I would like to know, if the users exist already (so they don’t need to be created), will this extension allow to simply assign these existing users to the groups I indicate or do I necessarily have to create the users using this Groups extension? you could use the users admin section (Users->All users) to assign various user to a group. In the “Screen options” you can change the table limit to increase the number of users shown. Then select the users and add to groups your need (above the table). The new release now supports updates for existing users. Thanks for updating it, but I am still not sure I would be able to use it for my purposes. It looks like the user_email field is required for the import. In our case, many users don’t have an email added to their profile. So we were using Import Users from CSV plugin to create the users with a password but without an email, and then, at login time, we were forcing the users to add an email to their profile. I would really like to be able to use this extension because it makes adding users to groups really easy, but I can’t as long as the user email is a required column. Basically WordPress will require an email to create a new user which is consistent with the use cases we see implemented on the front and back end. The add_user() function will throw errors if no email address is provided but wp_create_user() will accept to create a user with an empty email address by default. It’s inconsistent and the decision to require the email is consistent with sensible uses cases we can execute with the facilities provided by WordPress on the front and back end. That said, why do you force users to provide an email at login? I’m trying to understand your use case. I have grabbed my users from the AD & also grabbed the department field. Is there any ways to automatically add the users into the groups by their department? is this plugin export the expiary date of user in a group ? Hi, only in part as user meta data but to import it doesn’t support it fully yet because of termination schedules that would have to be added. but i don’t understand exactly that how is the exported file ? 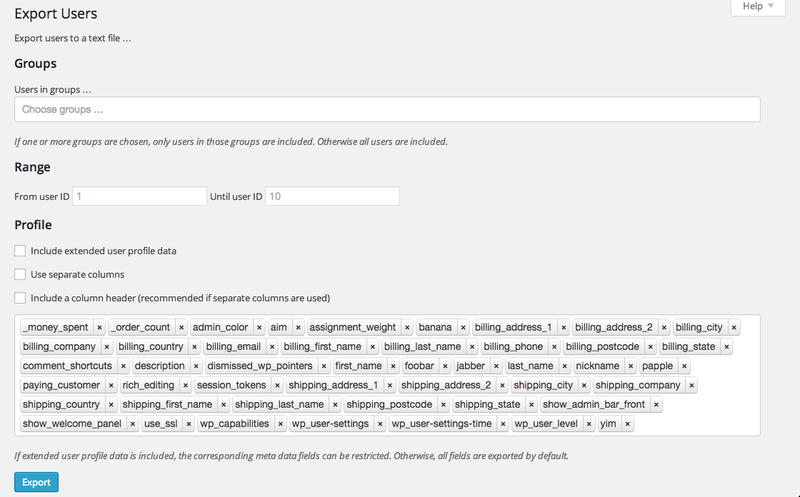 what is the column of exported file when we use group for woocommerce ? Here is an example of exported data which includes complete extended user profile data. How do we edit the email that goes out when we import users. I don’t want my uses to go to the wp login page, and I’d like to add some basic instructional text to the page. I’m assuming there’s a php file somewhere we can edit that it. There’s a plugin SB Welcome Email Editor which can be used to customize the welcome email. I tried that plugin, but it’s not working. I make the new email in the plugin, but your Groups Import/Export plugin keeps sending out the default password reminder email from WordPress, which uses the wp-admin url as the login url. Am I doing something wrong in the welcome email plugin? So your plugin doesn’t send out its own email? It uses wordpress’s default password email? Is that correct? Yes that is correct, it uses the default email. Hm … maybe a filter could be added later on but for now unfortunately there is only that option. OK. I figured there would be a plugin to edit the default password email, but the few I found apparently don’t work with wp 4.0. I’m surprised there aren’t more options to change that. For this site, I’ll just not use the part of your plugin and send manual emails for everyone with the appropriate instructions. I’ll set their user and pw to be their email address. That way one email can be bcc’d to all imported members and that should take care of it. Hi, I just wanted to add to this conversation that the email SB Welcome Email Editor sends out is still not what is sent when using Groups Import/Export. It’s been almost 2 years since this was first pointed out. Is there any indication of when this might be added? Not being able to send custom welcome emails is a show stopper for us. I have created a custom code that you could use. Does anyone know if this plugin will import and export all customer fields on My Account page, including custom ones I add? It won’t in its current version but it would be a great addition, I’m having a look right now to see if we can add this. So please feel free to end one comment thread and continue on the other. I really hope you can add that function soon. I bought the plugin “group imports and exports,” but it does not work. I need to export the group “registered”, edit it and then import the edited list in the group that I want. But when I export, I get a “time-out” error with the new BLANK page. I need to change the settings on the mysql server? if you have a lot of users maybe there is a connection timed out, you can try to increase the maximum execution time.